How should lifts be made when using two eyebolts? 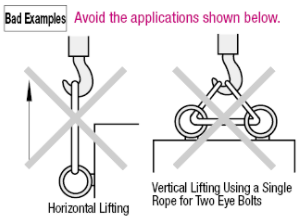 What is correct way of lifting when using two eyebolts? May 8, 2017, 5:04 a.m.
1.Force of lift should be vertical. 2.Using shoulder eyebolts you can use 45 degree angle or greater. May 8, 2017, 5:16 a.m.